28 Years experience in Food Safety and advising on food premise suitability. This has provided an excellent background for developing good and effective catering designs. As a private consultant for ten years, I have developed a very practical approach to food safety and quality based on Food Safety by Design. We aim to minimise risks by design. I now provide training courses nationally for EHO's on these principles. We have become progressively involved in Catering Design over the last 5 - 6 years but are still relatively new to this field of work, in relation to the provision of full specifications and providing project design and supervision. We try and concentrate on high standard designs. Major project involving detailed design of new build project and design of temporary facilities. The temporary kitchens are in use and the main building is now progressing with completion expected early 2007. Developed and submitted Environmental Impact Assessment for temporary facilities. Ad-hoc advice as required on design issues for a kitchen upgrade within existing building. The project was for a new kitchen and cafeteria building plus facilities within grounds of Audley End House. The project is on hold at present time. Called in by operators to inspect installation and devise solutions to certain design flaws. Works undertaken and project completed. New Hall College (2000 to 2003). This is the first major project where we have developed the design and layout; wrote the detailed specification and contract for the Catering Equipment Contractor; including all drawings and are overseeing the implementation of the relevant parts of the project. This project is now successfully completed. We produced a detailed design and specification for a new build project. The building is now completed. We did not project manage this which passed to the building contractor. Advisory capacity in relation to current kitchen ventilation problems. We developed solution to existing ventilation problems, provided specification and supervised works. Following our initial design and layout ideas for a new kitchen at this site, Berkeley Projects developed the detailed design and specification. MAS Environmental was then retained as part of the design team to advise on the specification, design and contract performance. We have been instrumental in ensuring full implementation of the design in accordance with the specification. The majority of the design concepts incorporated within this kitchen were the product of MAS Environmental's involvement. This project is now substantially and successfully completed. We were commissioned to assess the current catering facility and its need for upgrading. From this we developed a number of options for refurbishment, including detailed layouts and equipment proposals. The project is currently suspended awaiting funding funding. We were commissioned to produce catering layouts and design criteria plus identify equipment requirements in relation to full refurbishment of the main production kitchen facility. 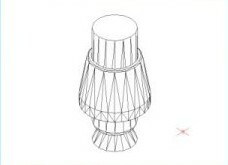 A number of concepts were introduced for the first time within the design. We were retained on the project team to provide advice on contract compliance and design issues and also to advise on the main servery proposals which are separate. This project also included a Sandwich Manufacturing Facility. This project did run into a number of problems which were not of our making. We have been retained to help reach resolutions and develop remedial works. Subsequently we were contracted by the University Estate Management Department to produce a specification with detailed drawings for the upgrading of part of the servery facility. Although not initially involved with the new kitchen design, we were asked to advise on the proposals and propose changes to upgrade and improve the design. These were incorporated into the design. We were also asked to advise on the temporary kitchen requirements that was to be used during the project. Subsequently we were asked to advise on the suitability of finishes and facilities provided within the refurbished kitchen along with recommended remedial works. Sushi Express. MAS Environmental advised on the re-design and layout of the factory at Sushi Express most of which has been implemented. Wicked Cake Co. For some years MAS Environmental provided advice on the gradual upgrade and re-design of the Wicked Cake Factory layout. University Centre. As part of the main contract (See above) I was commissioned to determine the layout and facility design for a Sandwich Production facility at the Centre. Available space was extremely limited and as a result space utilisation had to be optimised. Pristine Foods. This is a relatively new Sandwich and Buffet food production facility where once again MAS Environmental were asked to provide detailed advice on design issues and construction works. The approach outlined below is very time consuming and therefore involves increased costs compared to many catering design contractors. The great difficulty that often arises is the balance of cost and providing the required / desired input. We attempt a higher level of project supervision and involvement than most. This has many benefits but increases cost. It is important that the client obtains an operational facility that achieves their aims and meets their needs. It also needs to incorporate flexibility to meet potential future changes both operationally, legally and arising from unforeseen changes such as replacement equipment. Alterations to equipment and layouts can prove costly. Whilst this is generally to be avoided, forced changes do arise. Impact can be minimised by building in flexibility within the design. Chefs change and with that can change the type of Catering operation. There is a need to assess the existing catering operation, what is aspired to provide and what may be needed should changes arise. 1. Obtain a clear understanding of the existing operation and approach to food production, including the principle objectives and priorities for service provision, i.e. Quality versus cost etc., quantity, times and special requirements. 2. Identify food production requirements in terms of service types - Silver service, Grab and go foods, Canteen style, Fellows dining and the equipment and facilities needed to meet service provision. 3. Identify potential future needs and areas where quality and efficiency in both the operation and the final food production can be improved (If possible). 4. Identify any food safety issues, ergonomic and safety problems and current practices that can be improved. 5. Identify the architectural and mechanical constraints and those already arising from the project. These processes require observations of catering operations and detailed discussions and consultation with staff and possibly customers. Subject to time restraints. 6. Identify additional constraints in terms of budget, space, staffing, existing equipment and needs. 7. Identify any temporary catering requirements and how the contract is to be implemented with minimum disruption. 8. Assess suitability and life of existing equipment. Identify any potential opportunities to re-use, refurbish or upgrade existing equipment. 9. Catalogue existing equipment for re-use, measure and photograph. 10. Develop different operational layouts / designs and equipment options that could enable objectives to be met within the space and budgetary constraints. There is an extensive range to equipment and facility costs depending on the expected life of the facility, the desire to reduce operational overheads and the need to meet aesthetic as opposed to functional needs. 11. Consult widely on proposals and amend to incorporate needs. Ensure highest food safety and quality of food provided. 13. Involve staff in concepts and design and get them to "sign up to it" (take ownership of the concepts). 14. Develop detailed design and specifications for tendering process, including detail on equipment provision and cleaning and refurbishment of re-used equipment. 15. Obtain tender prices and implement contractor selection process. 16. Review design to incorporate lessons ands views of tenderers'. 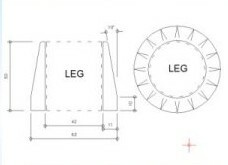 Confirm design and produce construction drawings and information. 17. Ensure Catering Contractors are fully aware of design requirements through a process of meetings and site visits to locations where similar design principles are employed. Sample production and approval to provide benchmark. Close liaison and supervision of works. Modifications to design and project as found necessary in progress. Early identification of snags and commissioning of items to avoid delays and the need for site re-visits. 19. On completion provide training and help develop and implement any food safety and quality systems required to ensure customers perceive and identify an improvement in food provision, arising from the investment. Finally, at MAS Environmental we undertake a number of detailed checks not routinely undertaken by other Catering Design consultants to ensure the reliability of the installation. These include temperature monitoring, airflow and noise tests (as necessary). They also include photographic records of condition of equipment and any defects. 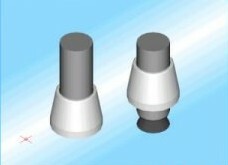 Below is a hygienic foot for a worktop leg designed by us and used in some of the kitchens listed above. 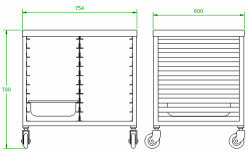 Below is our design for a mobile trolley now in use in some of the kitchens listed above. The lift-off top is made of stainless-steel and can be easily cleaned all over. The smooth design prevents any dirt build up giving a good clean piece of equipment that is easy to maintain.